You must make reservations at least 5 minutes in advance of the time at Bridgetown Mill House. From May to October (Friday - Saturday) live music on the patio. We are the perfect venue for weddings, showers, rehearsal dinners and business meetings. We have 2 private dining rooms that can each accommodate 24-60 guests and we accommodate outdoor tented affairs from 100 to 200 guests. 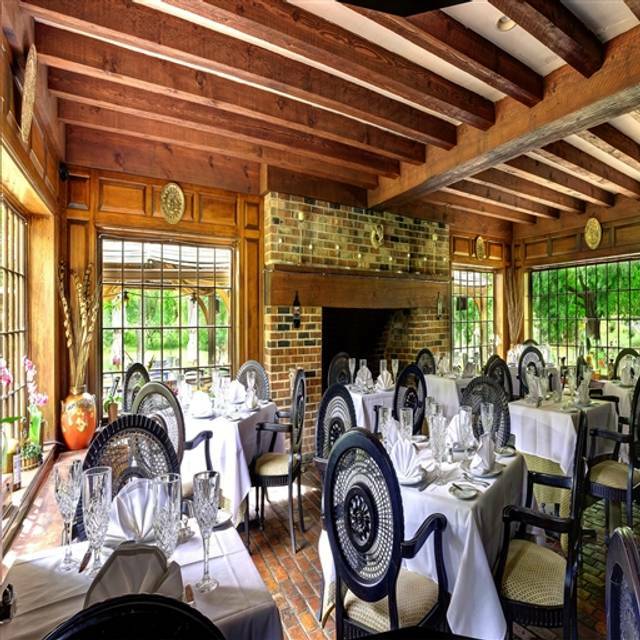 Enjoy outstanding American Continental cuisine while dining at this charming historic Bucks County Inn (c1791). The Bridgetown Mill House offers two private dining rooms, the Great Hall seating up to 26 guests and the Main Dining Room seating up to 70 guests,Tented patio fit 150+ people. My wife and I had a very nice experience at the Bridgetown Mill House. Very nice and clean; beautiful building; the servers/staff were friendly and attentive. Food was excellent and while a bit expensive I can't say it wasn't worth it. Portions were fair and an excellent well rounded menu. The chef came out to say hello near the end of the evening and she was very nice. Entertainment was provided (singer and guitarist and they were just wonderful). Overall a pleasant and romantic experience and we will go back. Fantastic evening all around! The owner was very attentive and the food was amazing!! Great place to have dinner. As long as you don’t eat. Very limited menu, food came out late and cold. Can’t blame the server, she was great. Will only go back for drinks in the outside deck. Lovely place with cozy dining, drinks and food just delicious. If you have the chance to have Nancy wait on you you'll feel like family before you leave. The head waitress/hostess, Nancy, was very helpful, knowledgeable and friendly. It was a fun place and a good choice for a New Year's Eve quiet dinner celebration. The prix fixe menu for New Years Eve was a 5 course meal, with very good portions for each course. Unique selections, well prepared, and nice presentation. Each course was very tasty and well made. The setting is beautiful, and the service was attentive. We attended the special New Year's Eve dinner and were underwhelmed by the food itself. That being said, I would still try again for the regular menu. I thought the prices were a bit on the high side but it was balanced by the live music. Excellent singer. Food was good. Presentation is as very nice. Went for Christmas Eve with one other person. Fixed menu, even though the website did not say that. Any changes were $10 more. Hit with a 20% gratuity in a fairly empty restaurant as well. Nice place with good food, but far better value elsewhere. Christmas Dinner with family. It was excellent! Food was delicious and servers were spot on. We were a party of 12, easily arranged in advance, for Christmas day dinner. Authentic Bucks County mill house setting. Greeted warmly, given tour of the restaurant. Creative cocktails, private dining room with music, fireplace, Christmas tree. Food was great, 5 courses. Hospitality and service was truly outstanding. Everyone enjoyed the holiday dinner immensely. Strongly recommended for your special occasions! The menu was innovative. It was disappointing that the top choice for my entree and dessert the restaurant had run out of. Our waitress was nice but often aloof, missing obvious times to attend to us. Still, this is a special place and one I will return to again. Very nice for a special occasion! The mushroom soup was good but the sea bass was previously frozen and incredibly fishy. I almost sent it back. The zucchini and Brussel sprouts were so over cooked, I could have rung out their water. The osso buco looked dreadful and tasted terrible. The food quality wasn’t even as bad as the worst wedding food I have had. The staff was incredibly friendly and the building is lovely but the food is just bad. A lovely restaurant in Bucks County with a varied menu and well-prepared food. The salmon was particularly good. Thanksgiving dinner menu was disappointing the soup was the only thing that was nice, the portions were way too big for a 5 course meal and it was so rushed as to keep turning over the tables, no way were you able to eat all that one after the other! Literally! No breaks between food before we even gave our choices on our meal preferences we were advised to take our desert to go!! and my turkey came out with so much fat on it as it was an end piece. The waitress forgot our drinks twice, we gave up asking for our daughters juice after 3 attempts plus we asked for Baileys coffee that we had seen come out and our waitress came with coffee with Baileys on the side, we then said we asked for a Baileys coffee and she came back with just the Baileys poured into the coffee. There was no choice in gratuity as 20% was automatically added to the bill. I usually always overtip because I work in the industry myself but their service was a sham not one but three waitresses we asked different questions to. Over beautiful setting but I wouldn’t return for food or service. Service was slow. No one checked on us after serving entree. Her fish was fine. My shrimp scampi was sweet and spicy. No garlic. Not what I expected. After servers ignoring us when I tried to pay with credit card I gave up and put cash on table and left. First time diners and can not believe we have never been here, since we are only 15 minutes away. If not for Open Table, we would not have known of it. A terrific spot, Osco Bucco and the lamb shank were terrific. Service was very friendly, efficient and attentive, without being over bearing. Ambiance was delightful and the background music was at a level that permitted ease of conversation. Definitely a redo. The experience would have been perfect, had there not been a Ukrainian wedding in the next room! Our waitress was very good! Good food and great for a special occasion. We were celebrating our Wedding Anniversary!!! Great food. Great ambiance. Great live music. What a wonderful place. The food was exceptional great presentation and preparation. Our server was fantastic.She handled the whole dining room by herself and did not miss a beat. The live music was really nice. The decor is very special and warm. This was our first time here and can't wait to return. Love it there bit the service could be very very slow at times. A really great place to eat. Very good value and excellent service. The food was outstanding. I was unaware of this place. Thru should advertise it better because it is far better than most of the restaurants in the area. The ambience is very relaxed. It is not noisy. And the food is prepared in a very special way. Have not been here in awhile, but it is a hidden gem. Quiet with wonderful live, soft vocal/guitar duo a background. Innovative quisine, nice wine list, good cocktails. Friendly, efficient personal service. Good food and service, not rushed, nice atmosphere and charm of in building from the 1700’s. Enjoyed sitting on the patio under the tent cover. The weather cooperated, the food was very good, and the evening enjoyable. A good choice for a dinner especially if outdoor dining is preferred. We've eaten here several times and the kitchen does a nice job. We had a delightful dinner in the beautiful dining room. Nancy, our server, was excellent. The food was delicious especially the French onion soup and oysters. The kitchen was slow but in keeping with typical French restaurants. The staff were very friendly. Last Tuesday we had dinner to celebrate a birthday and everything was just perfect. Cocktails on living room couch got us off to a great start while listening to nice music mix that played thru-out the evening with a wide variety. Our server was excellent in every way and made us feel very special. The dinner menu had several interesting selections - hard to decide. Garlic bread offered complimentary was very good and asked for seconds. Appetizers excellent but dinners were crazy good and well worth a slight wait. The total experience made my wife a happy birthday girl!! The building is a unique stone classic and grounds amazing. We look forward to returning to enjoy the outside bar/patio on a Friday evening to hear live music. This place provides great value for all it offers. Found this place on a whim. Glad we went. Food is great. I said to my husband “who ever cooked this made it from the heart”. Veal ossabucca was phenomenal, tender melt in your mouth. Lots of flavor. Nancy was our server, she was wonderful. Unfortunately a very poor experience. Waited 90 minutes for 4 entrees 2 of which were so poorly prepared and overcooked they should have never served them to the table. Nice atmosphere but food was not what we expected:( see food seemed to be not fresh! Good atmosphere. Live music that started near tables but, was moved near entrance. Food was very good but, plan on spending 2+ hours here. Kitchen worked at a very slow pace. Dinner was excellent. Server was very friendly. Desserts not made in house.